This afternoon, 11 December, I went to the airport for more dual practice. When I got there, I saw three or four small dogs--one was an adorable puppy wrapped in a blanket--at the FBO awaiting a rescue flight. One of the dogs managed to get loose and took off across the ramp. I heard that it was recovered safely on the other side of the airport, having crossed two active runways without incident. The Archer carrying the dogs taxied out and took off behind us. The sun was right in my eyes while flying the cross-country course to Lynchburg (KLYH), and it clearly showed how scratched up the windshields are on these training airplanes. The haze also helped to reduce the visibility, though the METARs reported 10 statute miles. The air was completely smooth, though. I botched another simulated emergency landing. I flew the pattern too tight, and no amount of flaps or slipping would get me down to the grass in time. 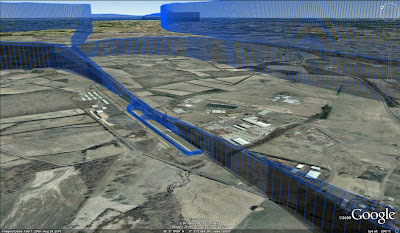 I also discovered a new way to screw up soft field landings: I tracked off to the left of the runway centerline after touchdown. I had been concentrating on making a smooth landing and keeping the nosewheel from touching through the use of throttle, but in so doing, I neglected my feet: not enough right rudder. Fixate on one thing in flying and it is inevitable that you will mess up another. I thought I had these down a long time ago--very frustrating. I'm beginning to see why there is an 80% attrition rate for student pilots. There was no one in the pattern at Culpeper (KCJR) and the winds were calm, so I was able to use both runway 4 and 22 to cut down on taxi time (my school isn't fond of touch-and-go's for some reason). It had gotten dark, and I had a tough time picking out HEF from the city lights in the background. After we got the plane tied down, my CFI asked me what I wanted to do. I opted to fly one more practice sortie before taking the last stage check. I want there to be no doubt in anyone's mind, especially mine, that I'm ready for the checkride. The stage checks have been exasperating exercises and I'd prefer not to fly another one before I feel completely prepared. This means that I won't finish up in under 50 hours, as I had been on track to do, but so it goes.